oExample: if 30psi (300Kpa) of top can pressure is needed then 45Psi of regulated air is required. -Manifold pressure MUST be supplied to the bottom of the diaphragm. -User can have a very low waste gate spring using this method. Use the spring that matches the lowest boost pressure you require. -A “Gauge” pressure sensor is required for measuring top can waste gate pressure. 0-75Psi is recommended. “Gauge” pressure sensors always start at “0” where the other types will vary with atmospheric pressure. -As you can see one solenoid is used to increase the pressure to the top of the diaphragm and the second solenoid is used to decrease the pressure. -First, you must select outputs for the increase and decrease solenoids. As you can see here we have selected Inj out 6 &7. -Next we must choose the correct settings for the Mode. “Closed Loop(wastegate back pressure control) must be selected. 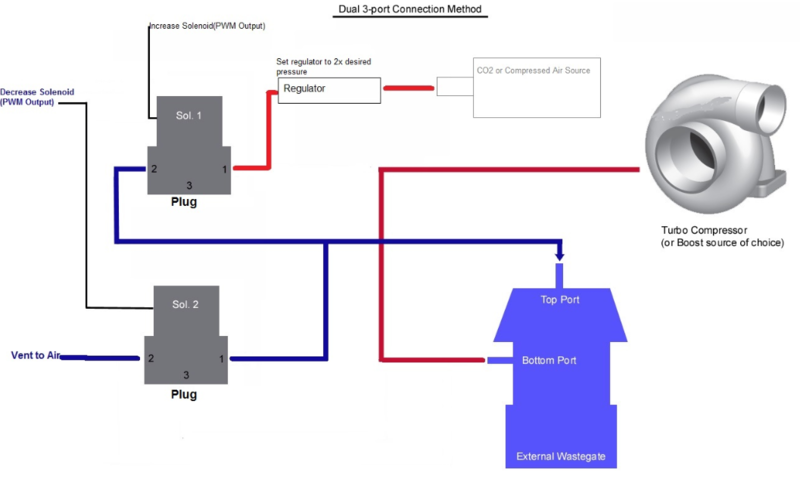 oYou can have 1 or 2 wastegate pressure targets and in this example we have chosen 2 targets. This will give us 2 different tables for boost control. 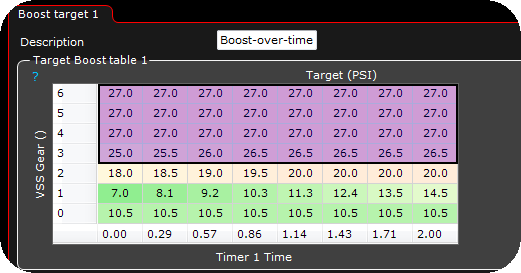 o“Target Boost Reference” tells the ECU the starting point of the pressure value. ✍“Above Absolute Vacuum” is used for Metric systems where “0” is the lowest value. ✍P stands for Proportional Gain. This value is the initial speed of attack for the controller. If the number is too high then the controller will over shoot the target. Too low and the controller will be slow to approach target. ✍I stands for the integral gain. After you have set the “P” the “I” can be adjusted. The “I” is used to hold the target after it is reached. To high of an “I” value and the controller will pulse. To low and the controller will lower the pressure after it has been reached. ✍D stands for derivative gain. You can leave this set to “0” for the boost controller. ✍The settings you see here should be close. ✍In some cases the “I”, or integral gain, will “wind up” and pulse out of control. This setting fixes that problem. ✍and the dead band is too low the controller will pulse. Increase this to ~1psi(7kpa) while adjusting the PID settings. ✍This setting will allow the tuner to test the boost controller when the engine is NOT running. This can be a problem when the solenoids are on and pulsing causing the battery voltage to drop. oThis setting allows the tuner to set a “ramp” rate for the target boost. A setting of “1” means the controller will increase the wastegate pressure 1psi/sec until the next gear is selected. oHere you can select the type of solenoid you are using. 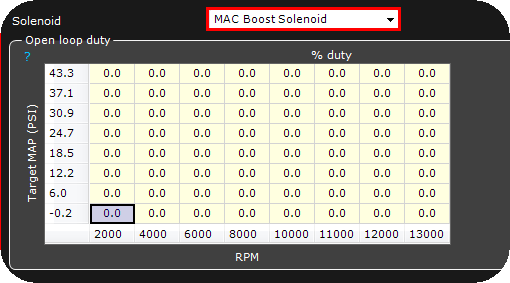 We have Mac and Pierburg default settings, but you can also enter custom solenoid values if needed. These settings are very similar to Injector dead time values. ✍This is the table you use to set the target pressure for the wastegate. Units can be Imperial or Metric. ✍The Axes can also be any variable. Gear, RPM, TPS, Timer, Gmeter or any other MaxxECU value can be used here. ✍Notice there is a “0” gear. This is Neutral or Launch gear.